Blue Wahoos staff at the team's booth at Twinsfest in Minneapolis. It seemed strange at the time. The owner of a baseball team saying wins and losses weren't all that important. But Blue Wahoos owner Quint Studer said just that when Major League teams visited Pensacola to try to woo the then-free agent Pensacola Blue Wahoos into their farm system. As different teams presented on the number of top prospects in their system and laid out scouting reports on their top talents, Studer stopped them. Winning is great. But a minor league team has no control over the players on the field, how the coaches train them, nor who gets signed or called up or traded for. So, instead, the Blue Wahoos were looking for a true reciprocal business partnership with whichever club they chose to be their affiliate that would make fan experiences better in Hoosville and help the team accomplish its mission of improving the quality of life in the city of Pensacola. Since officially agreeing to become the parent club of the Blue Wahoos in October, the Minnesota Twins have already gone to great lengths to show the city of Pensacola that they were the right fit for Hoosville. "It is essential that we partner with somebody who has the same level of commitment to standards of excellence that we do," Twins general manager Thad Levine said during his visit to Pensacola as part of the Twins Winter Caravan Pensacola. "The time we spent with Quint [Studer, owner of the Wahoos] and Jonathan [Griffith, president], it was crystal clear to us that they shared that…We are already talking about things we can do to improve the experience for fans but also for the players in the community. When you are around and see the growth and development in this community, that's what we want our players to be around. We want to make an imprint in this community and be part of something special for years to come." The Twins commitment to becoming an active part of the Pensacola community showed brightly last week at the first ever Twins Winter Caravan visit to northwest Florida. Hundreds of local fans enjoyed autographs and Q&A sessions with five guests flown in by the Twins, heaping plates of brand new signature food items, and games and prizes for fans of all ages. But, that wasn't the only big event that week for the burgeoning partnership between the Wahoos and Twins. The weekend before, eight members of the Pensacola front office were invited up to Minneapolis for a weekend of training from Twins staff and to participate in the Twins' annual Twinsfest celebration at Target Field. 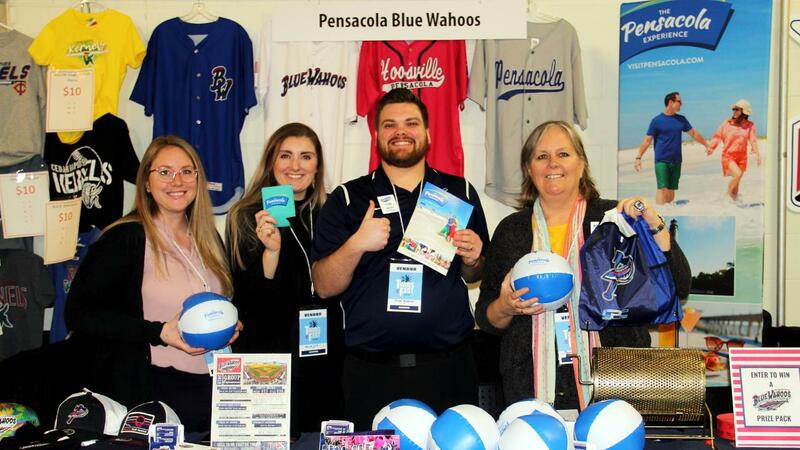 For three days, the Wahoos staff greeted the over 10,000 Twins fans that attended the team's annual winter fan fest, handing out Visit Pensacola Information Guides and beach balls and asking the same question over and over again: "Have you heard of Pensacola?" Surprisingly, most fans had heard of the Twins new Double-A affiliate's hometown. Many stopped to share stories of their military connections to the city or the times they had passed through on their way to Spring Training in Fort Myers. Many were planning trips back this summer to see the Twins top prospects on the field and gazed longingly at the pictures of Pensacola beach and Blue Wahoos Stadium propped up at the Wahoos booth while the historic colds of the recent polar vortex froze Minneapolis outside. Not just fans stopped by to meet the Wahoos. Top Twins prospects and future Blue Wahoos players Royce Lewis, Alex Kirilloff, and Travis Blankenhorn each swung by the Pensacola table to greet the team's staff on their way to autograph appearances and interviews throughout the weekend. When not greeting fans and future players, the Blue Wahoos staff spent the weekend learning as much as they could from their Major League counterparts. Despite the demands of running one of the nation's largest fan fests, the Twins staff spent hours providing stadium tours, answering questions, and offering advice and training to their minor league counterparts. After an in-depth behind-the-scenes tour of Target Field, the Twins $500+ million state-of-the-art downtown ballpark that opened in 2010, the Blue Wahoos staff met with the Twins operations department to discuss ballpark management before breaking into small groups to meet with their individual departments. Of the many topics discussed, the Twins offered advice on how to provide even more benefits and exclusive experiences to Season Ticket Members and team sponsors, how to improve in-game content on the video board and between innings, bringing brand new Twins-themed merchandise to the Bait & Tackle Shop, providing Twins memorabilia to display at Blue Wahoos Stadium, and expanding Wahoos community relations initiatives. While the changes on the field will be most apparent to fans this coming season at Blue Wahoos Stadium, as the Twins will bring an exciting crop of talented players from one of the best farm systems in the game to Pensacola, many other changes to the game day experience will be felt thanks to the training provided by the Twins and their commitment to their partnership with the Blue Wahoos that will ensure that the club will win off the field as well as on it. Following the trip to Twinsfest and the Twins Winter Caravan Pensacola, the Blue Wahoos staff sat down to discuss what they learned, what they planned to implement, and what their biggest takeaways were from their time with the Twins staff. The simplest answer came from Wahoos assistant creative services manager Derek Diamond. "Our missions as ballclubs are the same and our cultures have the same focus: to serve the community. The biggest thing I learned from our time with the Twins front office was simple. We made the right choice when we joined their organization."